A Wayfarer in Grand Theft Auto: San Andreas. 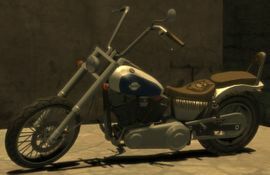 The Wayfarer is a motorcycle that appears in two different forms in Grand Theft Auto: San Andreas and The Lost and Damned. 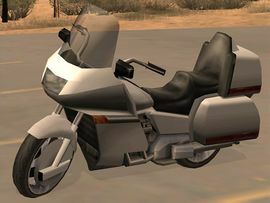 In GTA San Andreas, the Wayfarer is a full-dress touring motorcycle based on the Honda Goldwing, being very distinguishable by its large full fairings and hard luggage compartments. The Wayfarer in GTA San Andreas is one of the slowest motorcycles in the game, only faster than the Faggio and its variant, the Pizza Boy; however, with this trait, it is also the most stable at higher speeds. The bike is also heavy, thus making the bike less nimble and stunting with a wheelie to a stoppie virtually impossible. A Wayfarer in The Lost and Damned. In The Lost and Damned, the Wayfarer, indicated to be manufactured by the Western Motorcycle Company, resembles a more traditional chopper similar to the Angel (also based on a Harley-Davidson Panhead), but sports distinguishable accessories, such as beige, braid-trimmed seating (complete with an Angels of Death insignia), beige handle grips and a unique rear license plate with "Angels of Death" writing and logo. The bike comes with any one of two exhaust pipe designs. Like the Angel, the Wayfarer's engine power is the poorest among all The Lost and Damned choppers (although not considerably bad overall) as the bike only has an estimated top speed of 115 kph/71 mph, while its mediocre acceleration restricts the bike from reaching its potential top speed. In addition, the steering power of the bike is considerable poor, as it often has a wide turning radius and requires the bike's throttle not to be applied when corning at higher speeds. However, while still as heavy as choppers in the game, the Wayfarer lower torque allows the it to corner more easily, and the bike generally has good grip and braking. The Wayfarer is an Angels of Death gang vehicle, as already evidenced by the aforementioned insignia on its seat. Pedestrian models riding as passengers on the Wayfarer in GTA San Andreas typically suffer from an animation glitch where their lower jaws are pushed up their heads when in an idle facial animation (i.e. not moving their mouths to chew or talk), resulting in their heads disturbingly lacking a lower jaw. K Rose in GTA San Andreas. Usually found ridden or parked in any rural area of San Andreas or at the edges of cities. Always found parked in a small parking lot, next to Mount Chiliad, on the same road as the Angel Pine Junkyard. Found parked in the Shody Used Autos lot in Rockshore West, Las Venturas. The easiest way to obtain the Wayfarer in the entire game is in the mission Liberty City Choppers. After the player drives to the Angels of Death clubhouse and the brief cutscene ends, the player can steal it and drive the motorcycle to his parking space. Note: Once the player drives a short distance the player will fail the mission and a message will say "Jim is Dead". On extremely rare occasions it will spawn around the Angels of Death Clubhouse in North Holland/Northwood if the player is riding a chopper not associated with The Angels of Death (i.e. a Hexer, Revenant, Lycan or Diabolus). This page was last modified on 15 August 2013, at 19:01.